How else but through translating could we unearth our common humanity which lays the foundation of past eras and civilisations? Without translation, we would not have understood the laws of nature nor would we have made new innovations. During their golden era, Muslims were ethnically diverse and tolerant of new ideas. Translation played a part in their accumulation of knowledge and their ability to exchange scientific discoveries from India, China, Persia, Greece, Rome to the rest of the Western world through the gates of Spain. Today, here in Australia we are in desperate need for translation to play a part in bringing closer the ethnic communities, uniting them and preventing their polarisation and radicalism. We are a society of many tongues, diverse cultures, multiple religions. We are equal partners in one free nation that gives us so much more than many other countries are able to give to their citizens. The world outside our borders is a stage for many wars and conflicts, some older than Australian’s federation. Often times we find ourselves forced to suffer the consequences of these conflicts. We must bond together, understand one another, no matter how different our cultures are. Our salvation rests on raising new generations that are protected from the dangers of intolerance and hate both outside and inside our borders. We need a revolution in the education system. Our teachers from kindergarten to year 12 must have the persistence of the profits the resilience of revolutionaries and the wisdom of philosophers so they can teach our children the difference between justice and injustice. In Hamlet, the king of Denmark was assassinated with a drop of poison in his ear; our children’s eyes and ears are prey to the poison of hundreds of media channels and thousands of Internet websites. Our children have no time for innocence or spontaneity or for drinking from the fountains of accumulated knowledge of human cultures of the past. Should it be a surprise then that some may become radicalised. We wonder how they leave us to participate in external wars that have nothing to do with their lives. This challenge cannot be faced by the government but is in need of the work of NGOs, civil liberty groups and civil society. How to accept the other, respect other cultures, and maintain our humanity in order to guarantee justice is the only way to protect our youth from violence and radicalisation and a narrow-minded vision. 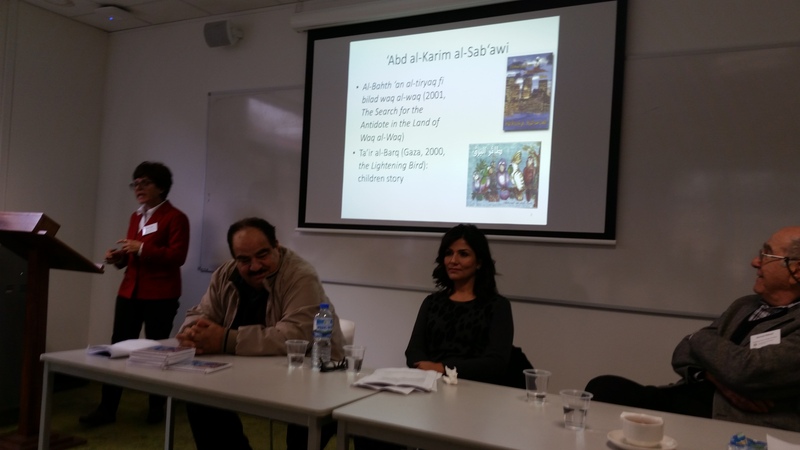 We need to build strong bridges between our cultures and translating texts and literature is a large part of that. 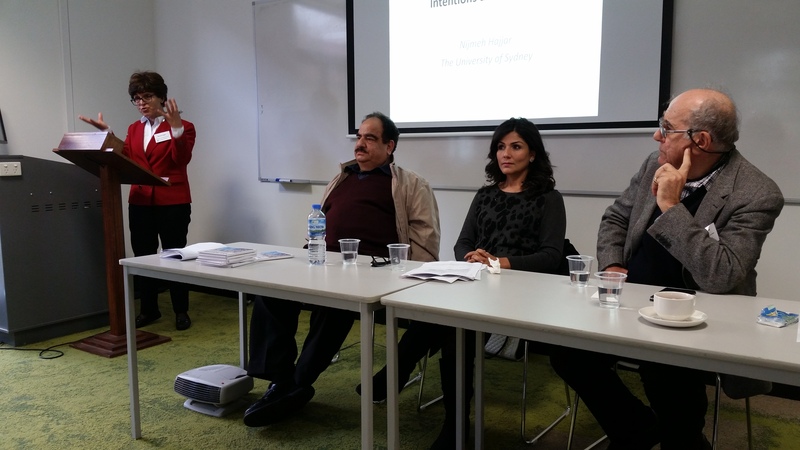 From left to right: Panel – Arabic-Australian writing – Participating Chair: Nijmeh Hajjar spoke about the ‘The Arab Australian Novel: Intentions and Methods’ in it she highlighted some of the work of Mr. Abdel Karim Sabawi. 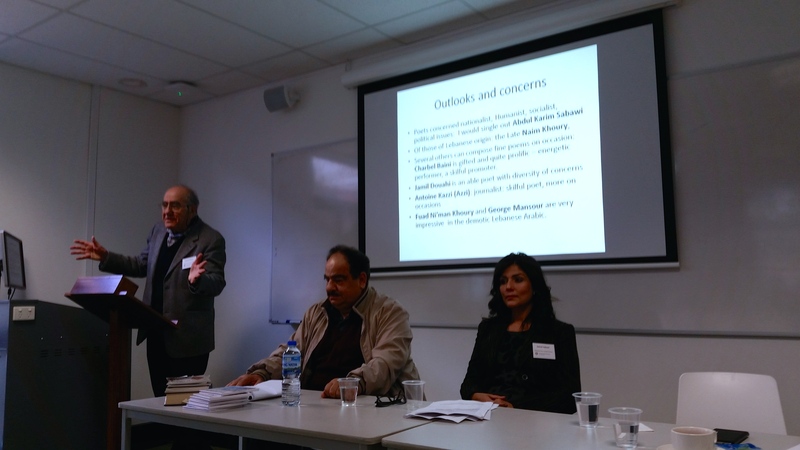 Also on the panel were Abdel Karim Sabawi and Samah Sabawi presenting ‘Beyond Language: poetry in translation’ and Dr. Ahmad Shboul presenting ‘Reflections on the Life of Arabic Poetry in Australia’. أهداني الدكتور محمد البوجي مشكوراً هذا التسجيل .. لمقابلةً بثها تلفيزيون فلسطين من غزة قبل عشرين عام. زهير إبن أبي سلمى مر بأطلال أم أوفى بعد عشرين حجة .. و لأياً عرف الدار بعد توهمه ..التوهم ليس وارداً في مثل حالتي .. كل شيء واضح و جلي . غزة تحت الحصار المرير منذ تسعة اعوام ..تلفزيون غزة تم تدميره مثل كل المرافق الاخرى على يد من قررو إعادة غزة إلى العصر الحجري ..الأشقاء العرب يتفانون في حروبهم الأهلية و يدقون بينهم عطر منشم ..و قد أداروا ظهرهم للقضية التي كانت على حد زعمهم قضيتهم الأولى .. الشعب الفلسطيني وحده يواصل صموده الملحمي متحدياً ظلمة هذا الليل الحالك رافعاً فلسطين فوق أكتافه مثل نجمة صبح .. تنفتح عليها عيون أبنائه و تنطبق عليها عيون شهدائه و لا يرضى بغير النصر المبين طال الزمن أو قصر .